10:46pm: Arizona’s interest in Cueto was and perhaps still is rather intense, according to reports. The organization sent a delegation including GM Dave Stewart, chief baseball officer Tony La Russa, and president Derrick Hall to the Dominican Republic to meet with the righty, ESPN.com’s Jerry Crasnick reports on Twitter. And the D’backs still have interest after the initial offer was rebuffed, per Bob Nightengale of USA Today (via Twitter), who adds that the club “realize[s]” that Cueto can command more than a $20MM AAV over six years after Jordan Zimmermann got $22MM annually for five. Of course, the Diamondbacks aren’t alone in pursuing the veteran. Among the other teams to reach out to his representatives are the Dodgers, Giants, Red Sox, and Cubs, per Jon Heyman of CBSSports.com. That group of large-market contenders has always figured to factor at the top of the free agent pitching pool. 11:52am: Johnny Cueto reportedly rejected a six-year, $120MM contract offer from the D-Backs recently, and ESPN’s Jerry Crasnick now reports that teams in the market for Cueto believe he’s seeking $140-160MM in total — a contract that would vault him into Jon Lester territory (Twitter link). According to Crasnick, the Diamondbacks initially planned to offer Cueto about $110MM but upped their offer to $120MM late in talks (Twitter link). The increase, however, wasn’t enough to get the job done. It would seem, then, that Cueto’s camp is seeking a contract that doesn’t offer any sort of reduced rate due to the minor elbow issues that plagued Cueto this summer or due to his late-season struggles. Cueto was masterful in his first four outings with the Royals, pitching to a 1.80 ERA in 30 innings, including a complete-game shutout of the Tigers. However, he limped to a 6.49 ERA over his final nine starts (51 1/3 innings). There were a few quality starts mixed in toward the end, but many speculated as to whether Cueto was fully healthy. Cueto and Salvador Perez reportedly worked to adjust where Perez would set the target for Cueto’s pitches, but he still had mixed results from that point forth. Cueto’s postseason was a true mixed bag — one so-so start, one meltdown and a pair of dominant gems in pivotal games. His final outing — a one-run complete game over the Mets in Game 2 of the World Series — was a nice final impression to make as he headed into free agency. Nevertheless, Cueto’s overall body of work following his mild elbow flare-up and trade to the Royals saw him yield 58 earned runs in 106 1/3 innings (4.91 ERA) with a 75-to-27 K/BB ratio and 118 hits (13 homers) allowed. None of that is to say that Cueto can’t or shouldn’t secure a hefty payday, of course. Despite those issues, the perception of Cueto has remained that he’s one of the three or four best starters on the market (depending on one’s feelings about Jordan Zimmremann), and we at MLBTR still projected him to clear $100MM with relative ease (though the $120MM he rejected already surpassed our most recent $115MM figure). Prior to those issues, a Lester-esque contract was a perfectly reasonable expectation for Cueto, and the possibility that he exceeded that figure was certainly present. Cueto, after all, logged a 2.48 ERA in 677 1/3 innings from 2011-14 despite pitching his home games in one of baseball’s most hitter-friendly parks, and he carried a similarly elite 2.62 ERA and a 120-to-29 K/BB ratio through 130 2/3 innings with the Reds this season. Cueto is a clear front-line starter when healthy and at his best, and he’s entering the open market heading into his age-30 season, having not yet even celebrated his 30th birthday as of this writing. That he’s already received a $120MM offer suggests that the demand for his services is strong, which certainly plays into his camp’s favor as the Winter Meetings approach. NOVEMBER 30: The deal is official, Hague himself announced on Twitter. NOVEMBER 25: The Blue Jays have reached an agreement with the Hanshin Tigers of Japan’s Nippon Professional Baseball that will send Triple-A International League MVP Matt Hague to Hanshin in exchange for $300K, reports Ben Nicholson-Smith of Sportsnet. The deal isn’t yet complete, according to Nicholson-Smith, but Hague has been removed from Toronto’s 40-man roster. In situations such as this, the money exchanged will typically serve as compensation for the team’s agreement to release the player, who is then free to sign a new, more lucrative contract with the overseas club. It’s not clear what type of contract Hague will receive in Japan, but he’ll certainly earn more than he would have with another up-and-down season with a Major League organization and could very well secure $1MM or more. Hague, 30, had the best all-around Triple-A season of his career in 2015, batting .338/.416/.468 with 11 home runs in 596 plate appearances. While the home runs were shy of his previous career-highs, he’s never hit for the type of average or gotten on base at that lofty a rate previously. Hague split his time evenly between first base and third base this past season but has a good deal more experience playing first base in his career as a whole. The Blue Jays claimed Hague off waivers from the Pirates in 2014 based on the strength of his Triple-A numbers, but while he continued his excellent minor league production with Toronto, he received just 15 plate appearances on a Major League club rife with potent corner options (most notably Josh Donaldson and Edwin Encarnacion but also Chris Colabello, Justin Smoak and, earlier in the season, Danny Valencia as well). Hague is a career .226/.286/.262 hitter in a small sample of 91 Major League plate appearances but has a far more robust triple-slash of .302/.377/.433 across parts of five seasons at the Triple-A level. The Royals have agreed to contract terms with lefty Tim Collins to avoid arbitration, the club announced. Collins will earn $1.475MM for the 2016 season, Jeffrey Flanagan of MLB.com reports on Twitter. That’s exactly what he made last year and what MLBTR predicted for the coming campaign. The reason: Collins, 26, missed all of 2015 after undergoing Tommy John surgery in March. Obviously, though, the Royals believe in his arm. While he’s small in stature, Collins still delivers his average fastball in the 92 to 93 mph range. And between 2012 and 2013, he logged 123 innings of 3.44 ERA ball with 10.6 K/9 against 4.5 BB/9. Most importantly, perhaps, Collins has actually been slightly better against right-handed batters. With age still on his side, there’s still plenty of potential value there for the defending World Series champs, who haven’t shied from taking injury risks on relievers in recent years. It’s not entirely clear when Collins will be ready for full action, but Kansas City will probably be looking for other southpaw pen additions regardless of when that’s expected. The club’s only two southpaws to top twenty innings out of the pen last year — Franklin Morales and Brandon Finnegan — have been lost to free agency (at least for the time being) and trade, respectively. The Mariners have shown interest in free agent outfielder Nori Aoki, Bob Dutton of the Tacoma News Tribune reports. It’s still not clear whether talks will progress to a deal, Dutton’s source noted. Aoki, 33, had a solid first half last year with the Giants but struggled down the stretch with a fairly significant concussion issue. While we’ve heard indications that he’ll be at full strength, San Francisco declined to pick up his seemingly reasonable $5.5MM option. Of course, it could be that the team simply decided to go in another direction. He’s hardly an exciting player, but Aoki has been slightly above average at the plate, rather consistently, in his four years since coming to the majors. His .287/.353/.380 slash was good for a 112 wRC+ last year, and both UZR and DRS rated him as an average or better option in the corner outfield. Though Aoki’s overall baserunning numbers weren’t favorable in 2015, he managed to swipe 14 bags in just 93 games. For Seattle, Aoki would likely slot in as part of an outfield rotation. The club’s possible outfield mix currently features two lefty bats (Seth Smith and Leonys Martin) and three righties (Nelson Cruz, Franklin Gutierrez, and Mark Trumbo). (Of course, some of those players could also factor in at DH and first.) It’s not immediately obvious how things would work out if Aoki were to be added, but it’s worth recalling that new GM Jerry Dioto has already done a lot of asset shifting this winter and could have more in store. ESPN Chicago’s Jesse Rogers has penned a column on the status of the Cubs’ targets in free agency at present. To this point, the team hasn’t given any indication that a pursuit of either Zack Greinke or Johnny Cueto is a possibility, leaving David Price as the sole top-tier arm that the Cubs could be expected to pursue, Rogers writes. The Cubs’ Plan B in terms of free-agent pitchers focuses on Jeff Samardzija at this point, according to Rogers, and sources tell him that the team is also in the mix for Ben Zobrist. Signing Zobrist would all but ensure a trade of Starlin Castro, but of course, there is widespread interest in Zobrist, who is one of the most popular free agents on this year’s market. Rogers lists Jason Heyward as a perhaps speculative target but notes that president Theo Epstein has pointed out in the past how young the game is getting, and Heyward, 26, would indeed fit into the Cubs’ youth movement in terms of position players. I’d imagine that signing Heyward would create further trade speculation surrounding Jorge Soler and Kyle Schwarber, though Rogers doesn’t indicate that Heyward is a top target of the Cubs as things presently stand, so much of that speculation would be putting the cart before the horse. CSN Chicago’s David Kaplan hears that the Cubs are active on many fronts at this point but still doesn’t believe that the Cubs will be significant players for Price or Greinke (links to Twitter). Kaplan hears that the Cubs are currently active on the trade market and are also in touch with the representatives for Samardzija, Mike Leake and John Lackey. Unsurprisingly, the Cubs’ highly touted farm system has many names that are in high demand as the team explores the trade market for starting pitching. Any of Samardzija, Leake or Lackey would give the Cubs a strong third starter to slot behind Jake Arrieta and Jon Lester in the rotation. Paul Sullivan of the Chicago Tribune writes that the difference between this winter and last offseason for the Cubs is that Epstein & Co. can now sell prospective free agents on the allure of joining a contender rather than preaching patience and trust that the rebuild will deliver a winning club. Epstein also explained to Sullivan a number of non-monetary incentives that the Cubs pitch to players, including the team’s new clubhouse and the programs the Cubs have set up for the families of players to enjoy upon relocating to Chicago. “Just little things behind the scenes we do that really impact the lives for our players’ families they may not be aware of,” said Epstein. Of course, as Sullivan notes, those factors alone probably won’t outweigh the difference between tens of millions of dollars, but they could help tip the scales in Chicago’s favor should they make a similar offer to another club for a free agent target. 5:28pm: The deal is for $2.5MM, MLB.com’s Mark Bowman tweets. 5:04pm: The Braves have signed righty Jim Johnson to a one-year deal, the club announced via press release. Johnson, 32, is a client of Moye Sports Associates. With the move, Atlanta has re-acquired one of the many players it traded away least year. Johnson was a part of the 13-player deadline swap between the Braves and Dodgers that also saw several more controllable assets change hands. Johnson first joined the Braves on a fairly cheap, one-year deal after enduring a disastrous 2014 campaign. He bounced back nicely, tossing 48 innings of 2.25 ERA ball with 6.2 K/9 against 2.6 BB/9. But things turned south again once Johnson reported to Los Angeles. He surrendered 21 earned runs in just 18 2/3 innings of work for the Dodgers. While he upped his strikeouts (to 8.2 K/9) and held his walk rate to under three free passes per nine, Johnson was done in by an over-.400 BABIP and 1.4 HR/9 rate in L.A. The Braves will hope that Johnson can once again steer clear of the control problems that ruined his 2014 season while continuing to generate something close to the 58.3% groundball rate he owns for his career. Metrics tend to think his ultimate 4.46 ERA last season was somewhat unlucky. Another feather in his cap: Johnson continues to deliver about a 94 mph average fastball, and even trended up in velocity last year. Atlanta has long been said to be targeting bullpen upgrades this winter. The team has relatively few sure things in the pen, though it received a promising campaign from Arodys Vizcaino and will eventually bring back the injured Jason Grilli. It’s not immediately clear whether the addition of Johnson means that the club will bow out of the higher-end pen market — where it’s been said to have at least done some window shopping — but Bowman adds on Twitter that “a setup man and another lefty reliever” remain on the organization’s shopping list. Royals first base prospect Balbino Fuenmayor — one of the more intriguing candidates to be selected in the upcoming Rule 5 Draft — is progressing very well in his recovery from a torn ACL this past summer, as recently noted by his agents at True Gravity Sports. Fuenmayor underwent surgery to repair the ligament on Aug. 3 but is running multiple times per week at present and is on track to begin baseball activities in early January. Baseball America’s J.J. Cooper recently listed Fuenmayor as one of the most plausible Rule 5 targets. The slugger, who was out of affiliated baseball at the age of 23 after receiving a huge bonus from the Blue Jays as a 16-year-old, reestablished himself on the independent circuit and returned to minor league ball in dominant fashion this past season, hitting .358/.384/.589 with 17 homers in 89 games before suffering his injury. The Indians are currently showing the most interest in outfielder Shane Victorino, sources tell Rob Bradford of WEEI.com (Twitter link). Cleveland was known to be on the hunt for outfielders even before Michael Brantley underwent shoulder surgery that will sideline him into next season, but that injury likely increased the team’s urgency to add some outfield help. Cleveland, as Bradford points out, had interest in Victorino before he signed in Boston and even offered him a four-year contract. Victorino, though, took three years to head to the Red Sox instead. The trades to acquire Francisco Rodriguez and Cameron Maybin earlier this month allowed the Tigers to sign Jordan Zimmermann, writes MLive.com’s James Schmehl. Filling a pair of holes without making lavish financial commitments allowed the Tigers to spend a more considerable sum than most had anticipated on a free-agent starter. Zimmermann said at today’s press conference that he was the second or third choice for a number of teams to whom he and agent Mark Pieper of Relativity Sports spoke, but the Tigers had him atop their list and wanted to sign quickly, which appealed to him (via Chelsea Janes of the Washington Post, on Twitter). Byung-ho Park arrived in Minneapolis today, reports Phil Miller of the Minneapolis Star Tribune, and his agent, Alan Nero of Octagon, is expected to arrive in the next day or so to finalize a contract with the Twins. Park said he’s spoken to countrymen Shin-Soo Choo and Hyun-jin Ryu as well as close friend Jung Ho Kang about the transition to Major League Baseball, with each encouraging him that he will adapt to the new league well. Park told Miller, via interpreter, that his goal is to remain in Major League Baseball for the rest of his career. Miller notes that Park does speak some English and is working on learning more as he prepares for the next phase of his career. NOV. 30: Both Gentry and Abad cleared waivers and were outrighted to Triple-A, the A’s announced (via Twitter). Each player has enough service time to reject the assignment in favor of free agency. NOV. 20: The Athletics announced today that they have designated center fielder Craig Gentry and left-handed reliever Fernando Abad for assignment. The moves clear space for the addition of second baseman Joey Wendle and left-hander Jose Torres to the 40-man roster. Gentry, 32 next week, is a plus defender in center field but batted just .120/.196/.200 in 56 trips to the plate this season with Oakland. He brings good speed to the table and has a history of production versus left-handed pitching (.274/.354/.366), so he could draw interest as a trade or waiver-claim candidate. Some clubs may not want him at his MLBTR-projected $1.6MM salary, however. If he clears waivers, Gentry has enough big league service time to refuse the outright assignment and hit the open market. Abad, 30 next month, was unable to replicate his outstanding 2014 results in 2015. After logging a 1.57 ERA with 8.0 K/9 against 2.4 BB/9 in 57 1/3 innings, he regressed to a 4.15 ERA with 8.5 K/9 against 3.6 BB/9 in 47 2/3 innings this season. Abad’s 5.50 FIP was even gloomier than his ERA, and he was hit exceptionally hard by left-handers, yielding a .277/.315/.545 batting line to same-handed hitters in 2015. MLBTR projected Abad to earn $1.5MM. 3:37pm: Pena’s $5MM guarantee will be spread out evenly, paying him $2.5MM in each season of the contract, MLBTR has learned. 3:35pm: Pena’s contract guarantees him a total of $5MM, according to Derrick Goold of the St. Louis Post-Dispatch (Twitter link). 3:11pm: The Cardinals announced that they have signed catcher Brayan Pena to a two-year contract. Tom Ackerman of KMOX in St. Louis first reported the news shortly before the announcement (Twitter link). Pena spent the past two seasons with the division-rival Reds, where he batted a combined .263/.313/.339 with five homers in 739 plate appearances. The soon-to-be 34-year-old walked at a 6.6 percent clip and struck out in just 10.2 percent of his plate appearances during his time with the Reds. Pena is a switch-hitter but is markedly better from the left side of the dish. From a defensive standpoint, Pena has typically thrown out a respectable number of baserunners, though this past season’s uncharacteristic 18 percent caught-stealing rate was the lowest of his career. That dragged his career mark down a bit, to 28 percent, though it should be noted that the pendulum swung the other way in 2014, when Pena prevented an excellent 43 percent of attempted thefts. Framing metrics tell a similar story, as Pena graded out as one of the worst pitch-framers in the league this past season but had previously rated anywhere from average to slightly above-average in his limited time behind the dish. The Cardinals will hope that the 2015 season was an aberration in terms of Pena’s defense, and he’s instead able to replicate the solid, if unspectacular defensive skills he showed prior to the most recent campaign. This signing figures to supplant the arbitration eligible Tony Cruz as Yadier Molina’s primary backup for the next two seasons. That makes it likely that Cruz, who is projected by MLBTR contributor Matt Swartz to earn $1MM next season, will be either traded or non-tendered before this Wednesday’s deadline, as the club probably won’t have interest in carrying three catchers on the roster. Braves right-hander Shelby Miller is one of the hottest names on the trade market, reports Jon Heyman of CBS Sports, with as many as 20 teams having checked in on the young right-hander. There’s no indication that anything is close at this time, Heyman notes, and the Braves are said to be asking a huge haul in return for Miller, who has three years of affordable club control remaining. 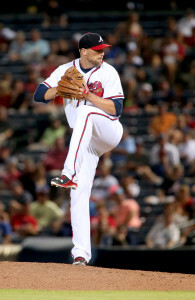 Miller, acquired alongside minor league righty Tyrell Jenkins in exchange for Jason Heyward and Jordan Walden, is coming off a strong debut season with the Braves. The former first-rounder logged a 3.02 ERA with 7.5 K/9, 3.2 BB/9 and a career-best 47.7 percent ground-ball rate in 205 1/3 innings (the innings total was also a career high). Miller won only six games due to Atlanta’s bullpen struggles and a lack of run support, but that actually enhances is value in a way. Teams won’t be deterred by a poor win-loss record when evaluating Miller, but the lack of wins will suppress his arbitration earnings, as the arb process still factors in pitcher wins/losses rather heavily. Miller’s strong body of work as a whole to this point in his career still makes for a $4.9MM projection from MLBTR contributor Matt Swartz, but the number assuredly would’ve been greater had his record aligned more accordingly with his ERA. One factor that clubs may consider, though, is that Miller’s overall numbers are propped up by what was an unsustainable run of sub-2.00 ERA production through the season’s first two months. From June 1 through season’s end, Miller posted a quality (but less impressive) 3.77 ERA with 8.0 K/9 against 3.6 BB/9 across 138 1/3 innings. Miller’s strikeout rates and control numbers have fluctuated somewhat throughout his career, but low BABIP totals and seemingly good fortune in terms of homer-to-flyball rate have led to a large discrepancy between his 3.22 ERA and metrics such as xFIP (4.08) and SIERA (4.10). Miller’s BABIP has always been below the league average, though, as has his HR/FB, suggesting that some of the perceived fortune could be more skill-based in his case. Ultimately, the value placed upon him in a potential trade (if he is moved at all) will be dependent on whether the club places more emphasis on his ERA or on his secondary stats. Even if Miller is more of a mid- or upper-3.00 ERA type of pitcher, three seasons of control over him would still come with significant value, so it’s logical to see Atlanta placing a sizable asking price on Miller when listening to offers from interested parties.